Attention: Marketing professional who need to generate MORE LEADS! Did I tell you that a landing page can be edited in 5 minutes? I’m Dawn Vu. For the past 6 years, I’ve worked with hundreds of businesses in multiple industries around the world. Basically, I partner up with businesses in their online marketing. I and my team have been creating websites, videos, funnels and other marketing assets; and manage them to get results that are leads and sales. The pages that they PAY to drive EACH AND EVERY VISITOR to don’t even have enough information that a potential customer need. If you’re doing local marketing, you probably realized that. Or just do some local keyword searches (business type + city) and you will see. This happens with display ads too. I’ve contacted several businesses and asked why they didn’t use landing page or at least, a better-looking website. Yes, mostly because it was too expensive! Some ‘website design’ guys are charging hundreds for a single landing page and thousands for a website created, which are always out of marketing budget of most local businesses. Competing with others is getting harder and harder nowadays, and when they pay more to win a visitor to their ‘online front desk’, they’re out of money to take care of the prospect. That’s sad, but when someone need a local service and come to a website that is lack of information, they will leave instantly. And as a result, the whole PPC campaign is just like throwing money out of windows. You know, landing page is not something new these days. It’s an ‘ancient’ thing in marketing world. But not everyone know how to do it the right way, even after the release of many landing page softwares. What If You (Yes, YOU) Can Give Local Businesses An Affordable Solution To Double Their Conversion? You can instantly see a great income, but I even see a HUGE opportunity behind. Double conversion means DOUBLE LEADS and SALES with THE SAME money spent. If you provide that to local businesses, you will have a great chance to offer other marketing services. From my years of experience working to optimize user experience and conversion in website, I’ve developed a landing page layout that is clean, simple but POWERFUL. It’s proven to convert a confusing visitor to customer. Remember the business owners who told me that they use poorly-designed pages because landing page and website are expensive? But how’s that relevant to you? From one landing page layout, I’ve designed 10 landing page templates for 10 types of local business. Selling an entire website is hard but selling landing page is much easier! So that you get the fact that many local businesses are using old websites and pages. But from my experience, it’s not easy to propose them with a new website. Instead, they will be interested in an affordable landing page ($97 to $197 is an ideal price) that can be used and get them results right away. 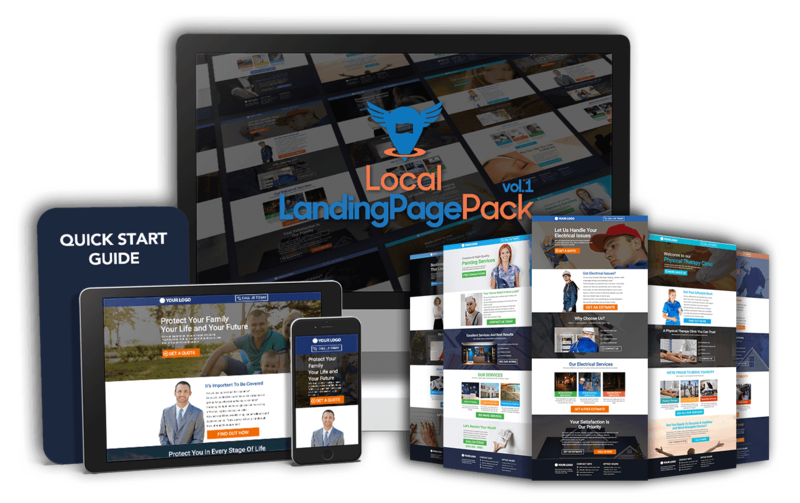 Local Landing Page Pack was designed FOR YOU with that in mind. As I said, it’s not difficult (it’s easy actually) to find a local business that is paying for PPC advertising. They’re in the top of the search result of Google for local keyword (You will find some in Bing too). With Local Landing Page Pack, you can sell well-designed landing pages that will skyrocket the conversions and get businesses tons of leads with THE SAME money spent. Imagine how much money, credibility and opportunity you will get! The best thing is that you’re targeting clients that are PAYING for their marketing. It’s 10X more effectively than approaching cold businesses that rarely invest in anything online. Other landing page template sellers only provide the templates with sample headlines like ‘This is an eye-catching… attention grabbing headline’, text like ‘lorem ispum dolor sit amet’, and you will not get any images in the download because they use stock photos. Local Landing Page Pack provides you with ready-to-use landing page copy and free-to-use images. Just fill the info of local business to the ‘blanks’ and the pages will be good to use. There is no ‘drag and drop’ software and it seems to be difficult to edit an HTML page, but with my detailed instruction, anyone can use a free software to edit the pages. The only requirement is the ability to use ‘Find and Replace’ function. Are You Ready To Become A Professional Local Consultant And Make Money Right Today? You can sell the landing page individually to a local business for no less than $97. I’d recommend you charge around $197 for a landing page. You can structure a “hybrid pay per call agreement” where you charge less up front for the page, but they would pay you for each Phone Call generated. This would make more sense to charge $97 for the page and then $$ Per Call! You can set up equity deals where you basically give the landing page away to a business (after you have an agreement in place) in exchange for a cut of all the sales generated through the landing page. I’ve found a 10% to 15% of gross sales agreement works well. Or if you can do other services, giving away a landing page to local business will make you a REAL pro and give you a HUGE opportunity to propose more high-end services later. You’re probably wondering what it’s going to cost..
Obviously I’ve given you my “conversion formula” so you technically could go hire someone to create your own landing page or buy a landing page builder and try to create something similar yourself. Instabuilder is $197 for developer version… the most affordable option. The cheapest stock photos with extended license to use to your clients are $37 a piece. A landing page will require 7-10 photos. I’m not sure how good you are at math but at least… that’s literally $2,787 for 10 landing pages. So I think you should use the little time you have available to instead use my landing pages and spend your time actually MAKING MONEY WITH THEM. I want to make sure my landing pages continue to produce results for those who buy them and their clients. Because of that, if I feel this product is reaching a point of “saturation”, I reserve the right to remove the buy buttons at any time. I’m totally confident with my product and I really appreciate that you’re here, today. So I wanted to make you an easy decision. Along with this crazy launch discount, I’m still willing to offer a guarantee just to make you confident with your purchase. Within 30 days, if you have any issues with Local Landing Page Pack that I can’t help you resolve, I will gladly refund every single penny. This is a completely risk free investment in your business that will help you get results as soon as you take action. Click The Button Below To Get Immediate Access! It’s Dawn again and I want to say thank you to read this letter today. I can’t wait to let you in and then tell your success story with Local Landing Page Pack! Wish you all the best with your business! P.s. Look, if all you do is taking IMMEDIATE action and sell just ONE landing page or sign an profit share agreement, it would pay 10 times for your investment.